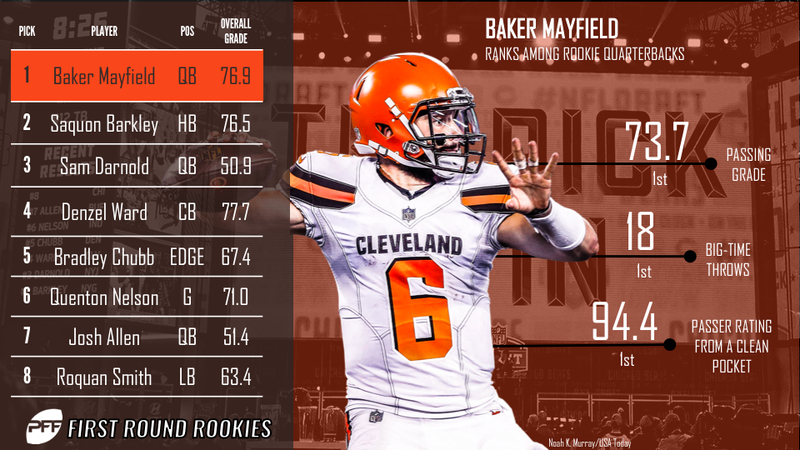 Week 10 of the NFL regular season schedule has been completed, giving us an even larger sample size to delve into just how each of the 2018 NFL Draft first-round picks has fared in their respective action so far. Some of the 32 first-rounders have not qualified for a grade either based on small snap counts or not playing altogether. On the other hand, some players have jumped out of the screen and have helped strengthen their teams. Barkley logged a career-high 20 rushing attempts in his Week 10 matchup against the 49ers, and he managed to generate 67 yards with 47 of those yards coming after contact. As has become the norm with the dynamic back, he also did damage in the passing game and caught 4-0f-5 targets for 40 yards after the catch. Once again, the Broncos’ first-round pick was productive in the pass-rush in his team’s Week 9 loss to the Texans, and he racked up three total quarterback pressures on his 19 pass-rush snaps. From Week 1 to Week 9, Chubb accumulated 35 quarterback pressures, which is the most among rookie edge defenders in that span.